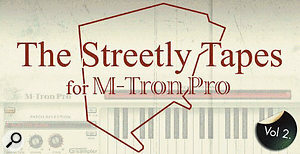 The Streetly Tapes series of expansion packs for Gforce's M-Tron Pro aim to get as close as possible to an authentic Mellotron experience. Compiled using the exact same processes and materials as for the original tapeframes, with no post-processing to clean up 'undesirable' artifacts, each sound was sampled directly from the Skellotron, Streetly's benchmark, perfectly aligned testbed Mellotron. The sampled tapeframes, therefore, sound just the same as the physical ones installed in the Skellotron, warts and all — no processed or otherwise 'corrected' master tapes are involved. Streetly take the opportunity to include not only classic sounds, but unusual and rarely heard offerings from their vast repository of vintage (and occasionally more recent) recordings. Twelve Violins: Strangely brutal in its naked form, judicious setting of the envelopes and a splash of delay transform this sound into something worthy of the great Mantovani. Cor Anglais: No vibrato, but a slight phasey movement suggests some sort of layering — very evocative of medieval period dramas. Cymbals & Marimba: The 'cymbals' covering the bottom five notes sound more like extremely lo-fi gongs to me. The remaining notes are a luscious tremolo marimba, softer than the Vol 1 version, and reaching further down to a low C. Italian Accordion: The definitive sound for playing the 'Captain Pugwash' theme! Lowrey Thru Leslie: If you watch Benidorm you'll be reminded of this sound from the theme tune — pure cheesy fun. M300B Violins: Solo violin played with vibrato, brighter than the core library's M300 variation. M400 Vibes: Bright, clear attack with lots of body and a slow mechanical vibrato. Medieval Woodwind: Unison oboe, flute and clarinet, plus bassoon an octave below the other three; reminiscent of John Williams' incidental music orchestrations for the Lost In Space TV series — except he didn't use a 'Tron. Miller Brass: A fabulously period sound evoking the dancefloors of the 1940s. MkII Violins: Perhaps the clearest version yet of this iconic Mellotron sound. Oboe: Played with no vibrato, nippy solo lines are chock full of Restoration Romp cheekiness. Orchestra: A big, fat melange of strings and brass, ideal for that big finish. Pinder Smooth Organ: This Leslied electric organ is a much clearer, tuneful and more positive version of the core library's oddly named MkII Church Organ. Rhodes: A muscular rendition, this sounds surprisingly good with a dollop of chorus. Ted Taylor Choir: Unashamedly lacking in higher frequencies, but ideal for adding warmth and weight to the thinner-sounding choirs. Two Trombones & Trumpets: Perfect for an early 1960s documentary about industrial progress in the North East. The Streetly Tapes remain the closest virtual equivalent to plugging in a real M400, and are sure to delight Mellotron aficionados of all ages and musical persuasions.